Whether you call it “pop”, “cola” or just plain “soda” it will be more expensive to purchase in Philadelphia come January 1st 2017. Recently, Philadelphia has passed the Soda Tax which will tax every ounce of soda by 1 and ½ cents. This tax will add $0.18 to every 12 oz. can, $0.30 to every 20 oz. bottle, $1.01 to every 2 liter bottle and $4.32 to every 24 pack of cans. The soda tax will affect all sugar sweetened beverages or SSB, leaving all milk, juice and artificially flavored drinks not eligible for the tax. The tax is aimed to raise funding for Pre-K education while helping fight obesity and diabetes, but has been met with a lot of backlash from the community of Philadelphia. Many residents are against the tax while some see it as a way to cut back on soda drinking. 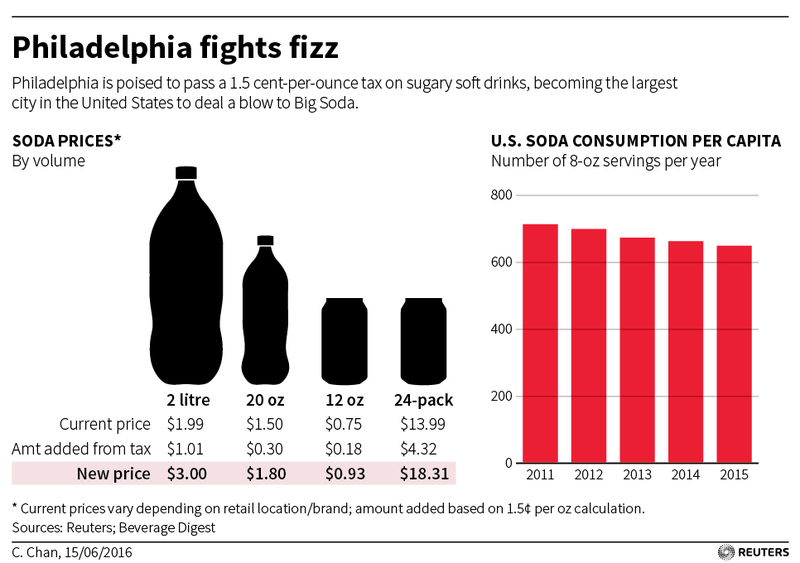 There have been cities before Philadelphia who have used a soda tax with varying results. When Baltimore had enacted a bottle tax in 2010 supermarkets around the city had seen a decline in sales and customer traffic1. Many customers began using business closer to suburban areas in order to forgo the bottle tax. Ultimately this lead to a loss of jobs in Baltimore. Seeing as how Philadelphia has a mass of suburban areas right outside its own city limit supermarkets could see a decline very similar to Baltimore’s. With over 2,000 beverage industry jobs in Philadelphia this could lead to less jobs and even the loss of some small businesses’. Philadelphia’s overall goal with the funds raised by the new soda tax is to increase spending on Pre-K education. It is predicted that almost 90 Million in funding could be generated. However, if the excise tax creates a decline in soda sales or even a shift to another product then that could ultimately lead to hole in the budget for Pre-K education. Harvard University researchers predict that this could have a great effect on health in the city. Increasing the price of soda may be enough reason to get people to switch to healthier alternatives such as water. It has been projected that 2,300 cases of Diabetes could be prevented after a few years of the excise tax 2. But while there are soda taxes present in 33 states there is currently no research to support that it would lower diabetes diagnoses and improve health by fighting obesity3. With the hope that 90 Million will be raised for Pre-K education in Philadelphia, new reports have been saying that 20% of the total money raised could go to other city programs4. With changes in the spending already coming so soon after the tax was initially passed it is easy to see how some Philadelphia residents could feel misinformed. It is unknown at this time whether more of the money raised could go to other programs not involved with Pre-K education. There are many pros and cons for the new excise tax in Philadelphia. It could create more revenue for Pre-K education and help people make more health conscious decisions at the grocery store. However, it could result in a decline of jobs and business’s if Philadelphia residents decide to do their grocery shopping in other locations to work around the tax. With many arguments taking center stage only time will tell what effect the excise tax will have on the city of Philadelphia.